Why you need Amway Nutrilite Protein Powder? We are surrounded by hundreds of protein powders available in market. Most of the times confused which one to buy. An Indian brand or international brands, choose the costlier one or the cheaper one. If it’s cheap then will it be pure or adulterated. After the selection of protein powder then come now when to use it, how to use and how much to use. Lets understand what is Amway Nutrilite Protein Powder? So a single product raises so many questions for us. I know how confusing it can be as everyone of us wants best value for the product. There are some people who make themselves very clear by believing that the expensive products are real. But people who cannot afford it’s difficult for them to choose the right one. As I had mentioned the top brand available in India for whey protein, I would also like to bring in to your notice the other form of protein which is called as Nutritional Protein. It is usually a combination of Carb, protein and fats. Obviously protein expected to be in high quantity. So the best quality of protein has maximum 80% protein in a scoop. It is a combination of soy protein and whey protein. Being a Nutritionist I have worked with many people who opt to choose different Nutritional supplement. So I actually know which protein supplement works best. I can name you few Nutritional protein powders like Resource high protein, Pentasure HP, Kabipro, Nutrilite, nephro HP, Proteinex. The highest % of protein is present in Nutrilite Protein powder by Amway. 1 scoop of 10gms contains 8gms protein. Nutrilite protein powder contains essential amino acids and body building materials. Nutrilite is a sub-brand of Amway, which was founded in 1959 by Jay Van Andel and Richard DeVos. One additional Benefit of this protein powder is that it doesn’t have any flavor and taste hence it can be blended with any food recipe. People who actually understand nutrition will surely recommend this as there is no other product better than this. I strongly recommend this to my clients and patients. Though it is comparatively a costlier product but have given excellent result to many of my clients. 1. People for weight loss Regime: As weight loss diet consist of low carb and low fat diet. This supplement is just suitable for them when they restrict food portion, there is possibility of missing out on some important nutrients. So this deficiency can be overcome by adding 1-2 scoop of this protein supplement. 2. For body builders: People who are into weight training and are not willing to go for professional Whey supplements can opt for this product. This protein has ability to burn off the fat cells and replace it with active cells called muscles. 3. Working Professionals: People who lack time to make food and are in hurry to leave for office in morning can have this 1 scoop protein powder in a glass of low fat milk along with some nuts. It will be a complete breakfast for them. You can check what are the problems faced by working professionals. 4. Patients who are in recovery stage or in physical trauma: The additional protein and vitamins requirements are high during recovery stage hence supplementing diet with this additional protein powder will boost up the recovery process. 5. Lactating Mothers: Along with calcium, protein also has equal importance for lactating mothers. Nurturing mothers is important so that they can nurture baby properly. 6. Adolescence and growing children: Growing children has increased requirement of protein. So adding this powder to their meals will be a good idea. And for fussy kids you can add into their chapatti flour and give them, they won’t realise. 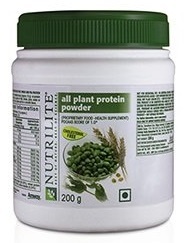 Nutrilite protein powder has good absorption rate. It doesn’t increase load in the kidneys. Hence it is a safe product. It is especially designed for vegetarians and vegans. I strongly recommend this to all you guys. People with Kidney disease or any infection can consult their physician before taking it. 13 Responses to Why you need Amway Nutrilite Protein Powder? NUTRILITE PROTIEN POWDER IS BEST OR WHEY? Depends on requirement by the body. Your body will not recognize the source of protein. And whey can substituted for your natural food protein very safely. It is a myth that Whey is only for body builders. It can be safely used by you, if your daily protein requirement is not been met by natural food. Thanks, but as u know also that high protein can damage kidney so don’t u think that whey for the body building only as they burn there Protein too much? Sumeet ahtis a very big myth. You need adequate amount of protein in your diet for regular wear and tear of the body. People who are body building their require is higher than ordinary person. You need 0.8-1gm protein of your body weight. My mom’s creatinine level of 9.2.
is Amway Nutrilite Protein Powder safe for her. You cannot give her proteins without consulting a Nutritionist. Need to check her entire days protein intake and accordingly we can introduce in her diet. what is the best protein supplement for Kidney disorders? Protein intake of entire day needs to be calculated and then to be distributed in all meals..